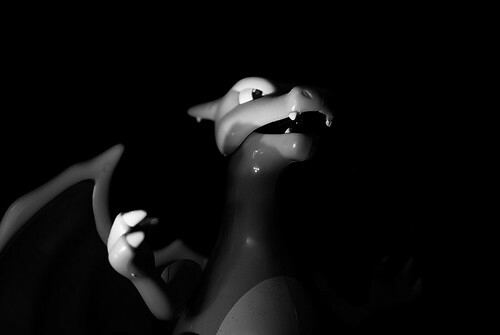 Charizard: he who stalks the night and steals cookies. Another "I left it too late and took a picture of the first thing I saw" night here. For all that I like the way the picture turned out. I've had this little guy since back when atara and I were still dating. Actually this one might even be hers - I bought us matching his & hers Charizards at the time. Shot in the light of a little LED shelf lamp. I went with 1/30th of a second, and f/3.3 so that the picture would have at least a bit of depth. I sharpened it a bit, converted it to black and white, and boosted the exposure and contrast a bit (which I often do when I do a BW conversion).